On October, 30th, Peruanos por el Kambio, Frente Amplio, Alianza para el Progreso and Nuevo Perú filed a motion to remove “for serious misconduct” José Chlimper from his current position as a board member of the Central Reserve Bank of Peru (BCR). To access the document click here and here. 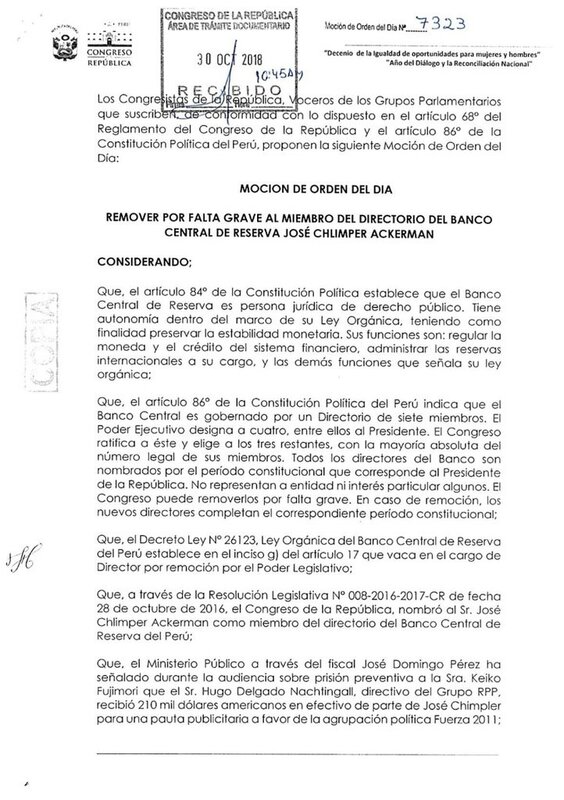 Alberto Quintanilla, congressman from Nuevo Perú, indicated that the main reason why they are requesting this removal is because Chlimper “would be involved in alleged criminal acts” that constitute “money laundering crime”. In that sense, he added that “it does not comply with the legal requirement of being a suitable person to direct and be a member of the board of directors of the BCR”. Although the congressmen of these four political parties expect the motion to be debated during today’s floor’s debate, it does not have the support of Fuerza Popular, which is the main force in Congress, and so far it has not been included in the agenda.